Today was a sunny and nice with calm winds except for an afternoon rain squall. The winds were from the south-west at 10 mph and the temperatures were in the mid 70’s. Good fishing today with catches of blow toads, sea mullet and puppy drum along the Buxton beaches. The big red drum made a showing out at Cape Point in Buxton today with several 40 plus fish caught. There was even a 45 in red drum caught down at Ramp 55 in Hatteras. There is no inshore report today. One boat ventured out offshore today and they had really good bottom fishing. Sea bass, vermilion snapper, amberjacks and triggerfish were caught. Today was a good day to be on Hatteras Island. We had temperatures in the mid 80’s and southwest winds after lunch. The winds turned west-south-west a little later on and blew around 9 mph. Tomorrow is forecasted to be a little cooler. Fishing is still a little scattered. We just need a push of cooler water, it’s just too warm. They were catching a few small bluefish, a few puppy drum and a few sea mullet in Avon today. Buxton had a few small bluefish as well. They also had some catches of spanish mackerel, sea mullet and pompano. Frisco had catches of small bluefish and sea mullet today. Hatteras had catches of a few small bluefish, sea mullet and pompano. It was a nice day on the sound. There were catches of speckled trout and puppy drum, even a couple of cobia. The offshore boats had a good day in the deep. They came back with catches of wahoo, yellow and blackfin tuna and dolphin. There were also some vermilion snapper and triggerfish caught. The sailfish bite was good, with 4 today and 1 blue marlin release. The River Rig Fish Like a Girl is a 2 drop bottom rig made with #4 hooks and fluro carbon with no snaps or swivels. Catches more sea mullet and pompano. 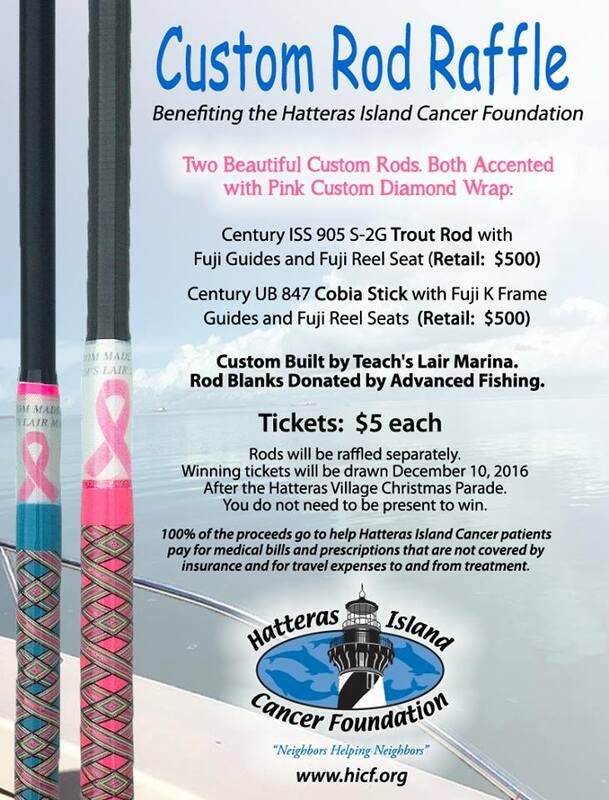 The Hatteras Island Cancer Foundation is excited to offer you a chance at winning either a trout rod or a cobia rod – both custom built and accented with pink custom diamond wrap and sporting the pink breast cancer awareness ribbon!!! Tickets are $5 each and we will be drawing the winners at the Christmas Parade in Hatteras on December 10th – you do not need to be present to win. 2016-2017 NC Hunting Season is here. Click on the highlighted link to see the seasons and limits for Big Game, Small Game, Dove, Waterfowl and Webless Migratory Game Birds. Clear blue skies again today. The temperature was around 70 with winds from the North again at 5-10 mph. From the beach today the fishing was scttered. In Avon from the beach and pier there was sea-mullet and bluefish caught. In Buxton there was more bluefish and sea-mullet b Not much here in Frisco there was a lot of grass. 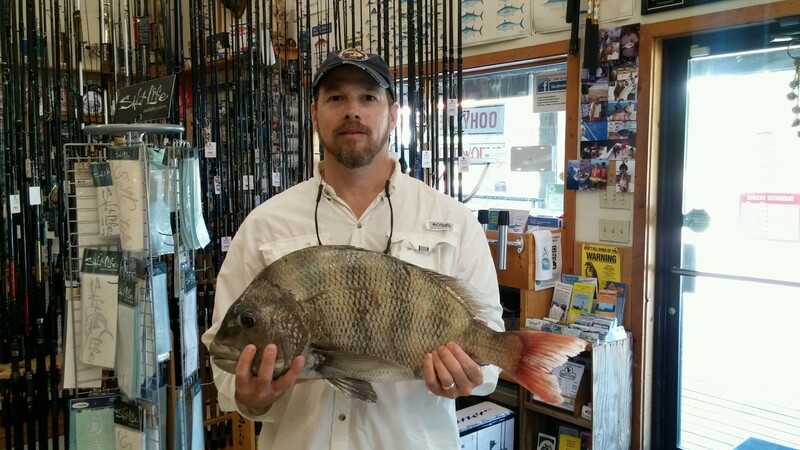 Hatteras beach had some nice keeper puppy drum caught along with flounder, bluefish and some blowtoads. Inshore today the speckled trout and gray trout fishing was great. There was a good bite from the bluefish also. The smaller flounder were biting today but only a few were keepers. Not much fishing from offshore today. There was a good amberjack bite and from the bottom there was vermilion snapper, silver snapper and triggerfish caught. Melissa and Doug toys 20% off. Woolrich and select summer t-shirts 30% off. Select Sperry shoes are now 50% off. Come by and see us at Frisco Rod and Gun, located at 53610 Hwy 12, across from Billy Mitchell Airstrip and Ramp 49. Open year round, 364 days a year. Visit us in the store or shop online anytime at friscorodandgun.com. The weather was great today. The temperatures were in the mid 80’s for most of the day. Winds were East at 10-15 mph calming slowly as the day went on. From the beaches today there was scattered bites. From the Avon Per there was pompano and sea-mullet caught. In Buxton there was bluefish biting at the point. Here in Frisco there was sea-mullet caught. Inshore today the red drum fishing was pretty good again. Offshore today the fishing was slower due to most of the boats staying in for Day at the Docks today. For the boats that fished today they had good catches of wahoo and a few dolphin. There was a few sailfish released today as well. Same versatile blade and handle style as the Kershaw Volt at a value price. Features SpeedSafe® assisted opening plus the convenience of a Flipper. Blade: 3 1/8″. Closed:3-7/8″. Wt. :3.4 oz. New t-shirt designs in for fall! Woolrich and select summer tshirts 30% off. Select Sperry shoes are now 50% off. It was another great day here on the island. The temperatures were in the lower 80’s. winds were light again today South-East in the morning turning North-East late in the afternoon. From the beach today there was some good fishing. In Avon there was sea-mullet, spanish mackerel and pompano caught from the beach. From the pier there was pompano and sea-mullet. In Buxton there was sea-mullet, pompano and some spanish from the point. Here in Frisco we had some good bluefish bites as well as some sea-mullet and a few flounder. Hatteras beach had bluefish and pompano biting. Inshore fishing slowed down today with only a few red drum being caught in the morning. This afternoon the bite was better but the numbers were down from previous days. Offshore today the dolphin fishing is slowing down but the wahoo fishing is picking up. There were black-fin and yellow-fin tuna caught today as well. From the bottom there was a good triggerfish bite and a vermilion snapper bite. Both feature 4’6″ 2-piece ultra light action tubular glass rods. Random Color (Orange, Green or Pink) spincast reel filled with 6 lb. line. New tshirt designs in for fall! Today we had clear skies again. The temperature was in the low 80’s the winds were 5-10 mph from the south-east. From the beach today the fishing was great. In Avon there was sea-mullet, bluefish, spanish mackerel. From the Pier there was a nice 59 pound cobia a good drum bite. In Buxton there was bluefish and spanish. Here in Frisco we had some sea-mullet, and bluefish. In Hatteras there was small bluefish, pompano, and some sea-mullet. Today we weighed in this nice 10 pound sheeps head the was caught near the Hatteras inlet by Jefferey Madre from Elizabeth City. Inshore today the fishing was good again. In the sound the puppy drum bite was great. 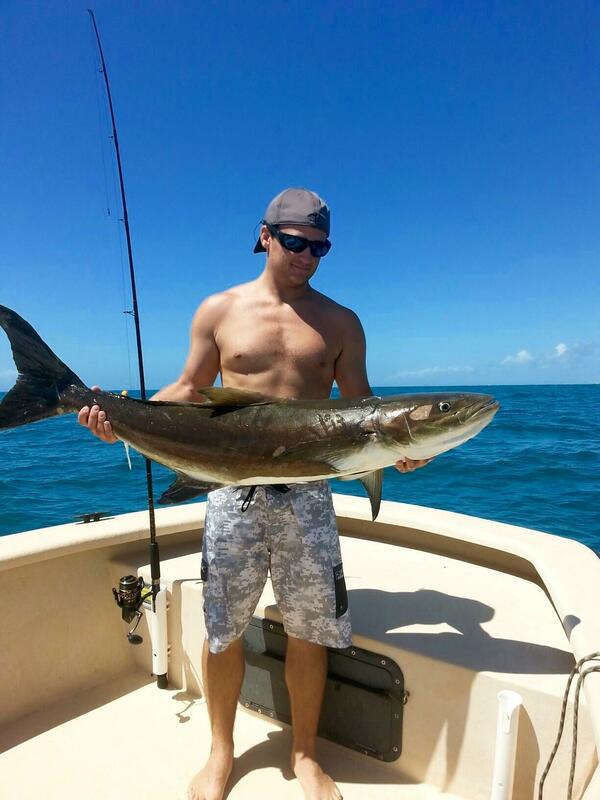 The cobia are still here and biting fairly good. There was spanish mackerel and bluefish caught today also. Offshore the dolphin bite picked up and there was good numbers to the gaffers and bailers. The wahoo was scattered and a few yellowfin tuna were caught. From the bottom there was vermilion snapper, silver snapper, amberjack, triggerfish, and some grouper caught. The Ilander® has a natural look and motion that attracts all species of game fish. Exceptional brilliance extends its detection range two-fold over naturals. Sperry sale shoes are now 50% off. We have new styles in for Spring too! New Hatley and Woolrich in for Spring. New t-shirt designs in also, kids and adults. It was a great day to be out fishing. The temperature was around 80 and the winds were east-south-east 5-10 mph. The skies were clear for the fist half of the day and clouds with scattered showers came in the afternoon. From the beach today there was some pretty good fishing. In Avon there was sea-mullet, bluefish, spanish mackerel, and some grey trout from the pier. In Buxton the spanish, bluefish, sea-mullet, and pompano were biting. Here in Frisco the fishing was slower with just some sea-mullet and bluefish caught. Hatteras beach had flounder show up with bluefish, sea-mullet, and pompano. Inshore today the drum fishing was good and the cobia slowed down. the spanish mackerel bite was pretty good. In the sound there was some grey trout caught. Josh Brown from Frisco got to fish the inlet today and caught this nice cobia. Offshore today the fishing was scattered. There was gaffer sized dolphin caught and a scattered wahoo bite today. From the bottom there was vermilion snapper, silver snapper, and trigger fish caught. 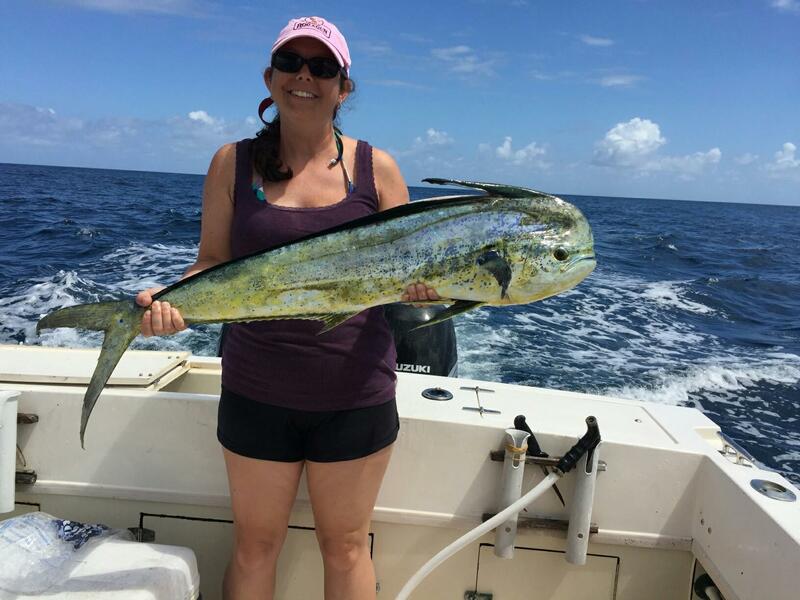 Angie Ballance went offshore today and caught a nice gaffer dolphin today.